Asteroid mining will likely be a reality by 2025. Here’s why that’s amazing. As Earth’s population continues to swell, the strain on our planet’s resources continues to grow. And although ecologists assert that we aren’t at the tipping point just yet, Earth has a finite amount of resources. Eventually, we are going to run out, so it makes sense to start planning for that inevitability now. One of the most promising avenues? Space. Asteroid mining is an endeavor that aims to acquire natural resources from comets, asteroids, and minor planetary bodies in our solar system. In invokes images of Bruce Willis and Ben Affleck (two of the most well know asteroid miners from cinema); however, asteroid mining isn’t just the stuff of science fiction. In fact, asteroid mining is quickly becoming a reality, and with good reason. 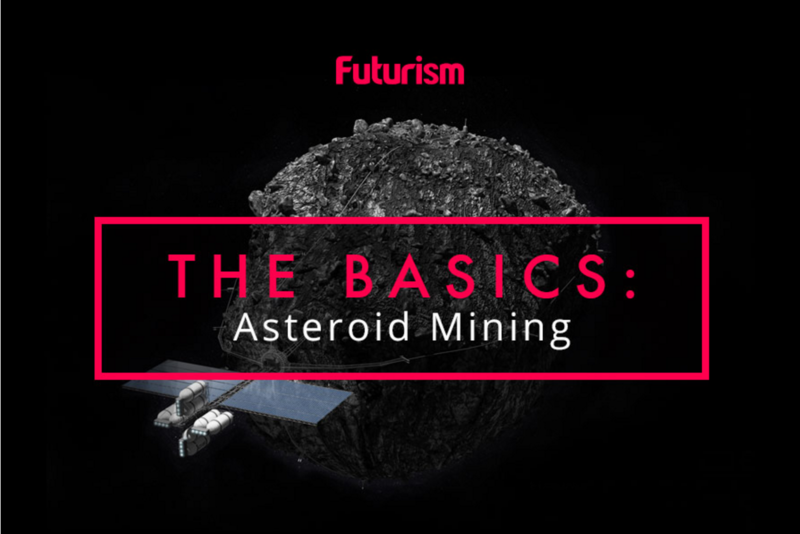 Want to know how asteroid mining will work? Click the image to see Futurism’s infographic. According to NASA, the mineral wealth that can be found in the asteroid belt (the region of space that exists between the orbits of Mars and Jupiter) equals out to the equivalent of just about 100 billion dollars for every person on Earth today. That’s a lot of wealth, but more importantly, that’s a lot of resources—and resources (not monetary gains) is really what space mining is all about. If you aren’t aware, getting materials from planet Earth to outer space takes an extravagant amount of fuel, and that means an extravagant amount of money. To that end, by acquiring raw materials from space itself, we could develop a host of space structures (such as colonies or space stations) and even generate rocket fuel, which will ultimately be needed if we ever hope to explore and colonize our solar system in a way that is economically viable. To that end, a host of governments and private companies are already working on asteroid mining projects. Luxembourg recently established a €220 million fund for space mining projects; the United States signed the Commercial Space Launch Competitiveness Act into law (which recognizes the right of U.S. citizens to own asteroid resources); and private companies like Planetary Resources and Deep Space Industries have a number of technologies in production to help humanity mine the cosmos. But how long will it really take us to get there? Of course, there is a difference between passing laws and working on technology and actually having a functioning mining operation. However, Lewicki notes that such operations really aren’t that far away. The timeline that we are really looking at is as soon as a decade from now. That’s ten years away…just ten years until we’re mining our first asteroid. Of course, there are a lot of things that need to happen in order for this ten-year timeframe to be met, but we are well on our way. The first concern is establishing clear regulations regarding asteroid mining. For example, who really owns asteroids, anyways? Can anyone just venture space with a flag and stake a claim? So it seems that the only real hurdle will be developing the necessary technology. So How Viable is it, Really? One of the major concerns with asteroid mining is, of course, getting to the asteroids. As was previously mentioned, a great number of the asteroids in our solar system exist in a belt between the orbits of Mars and Jupiter. And alas, that’s kind of far away. In fact, it’s about 330 million km (204 million miles). For comparison, the Moon is 384,000 km (238,000 miles) away from Earth. Fortunately, as Lewicki asserts, we may not have to go quite that far in order to get to find viable asteroids for mining. Ultimately, technologies for asteroid prospecting are already set for testing on Earth. Planetary Resources is launching Ceres, a series of Arkyd 100 satellites that will be carrying out advanced imaging of Earth. The sensors, which will eventually be used to prospect asteroids, are going to be used to deliver intelligence regarding the natural resource material on any spot on the planet. By 2019, the company plans to have a constellation of 10 Arkyd 100 microsatellites in low-Earth orbit, equipped with mid-wave infrared and hyperspectral sensors that can track water content, crop growth, oil and gas leaks, and even forest fires. And so, it seems, the era of space mining is already well underway, bringing us one step closer to a truly viable space industry.